Black Willow Soaps was born on Etsy.com on January 5, 2012, but the products came well before that! Years ago, I was curious about how to make handmade candles. I bought a "candle for dummies" kit from the craft store and started playing with different ideas. After creating some really great candles, I decided that I should expand my creative arts and try my hand at bath salts. After that came handmade soap and my first melt and pour kit. From then on, every girl in my family received baskets of handmade candles, soaps, and bath salts for Christmas! It has become a tradition. Last winter my mother and her friend, Kurt, decided that they were going to start making handcrafted woodwork and faux floral arrangements for craft shows to try their hand at the trade. I jumped at the idea to collaborate my products with theirs to get a jump start at my homemade business. Unfortunately, the craft show idea only went as far as visiting a local craft fair and making a few wood creations before it was no longer a live idea. I had already stocked up on eight different varieties of soaps and didn't have anywhere to put them! Christmas was already over and I wasn't about to store the soap for another twelve months. So, I decided to start the Black Willow Soap shop on Etsy. To my suprise, it has been a wonderful experience, especially since I had previously tried to sell my original artwork on Etsy and failed miserably. In the spirit of expansion, and the fact that I love to create websites, I decided to create a webpage just for Black Willow Soaps! mediums of paint and pencil. Coming up with a great and memorable name for a business was definitely not as easy as I thought! At first, I thought about cutesy little names with puns in them, but it just wasn't me and it didn't speak to who I was or what I was about. It didn't even speak to what I wanted my shop to be about. So , after giving it much thought I decided on Black Willow Soaps. My husband and I bought our first home this past May and of course, by that time, I had already decided what I wanted to plant in my yard (lavender, eucalyptus, bamboo, and a black willow tree). Unfortunately for me, the house that we bought was no where near enough water to ever sustain the life of a willow tree, so my choices were narrowed. I thought, since I can't plant a black willow tree in my yard, I might as well use it in my shop name. It has worked out great! 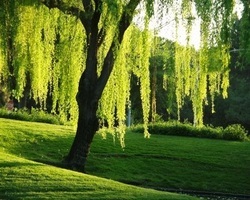 Now I get to see black willow trees on a daily basis and the name fits my personality and the products in my shop quite well. I think that it is a keeper!